Wraw offers you a broad selection of reports, with valuable insights into resilience and the impact on wellbeing for working people. Reports are available for individuals, teams, leaders, groups of leaders and the whole organisation. A snapshot of an individual’s personal resilience with strategies to enhance each of the pillars. 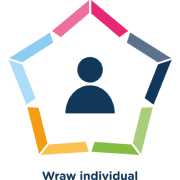 The individual report provides a comprehensive view of personal resilience and its impact on wellbeing for working people. Explore an individual’s current levels of resilience and how this is impacting the extent to which they are feeling the effects of pressures, challenges and adversities. Drill down into the 5 pillars and identify strategies to enhance personal resilience. Teams bring together a collection of strengths and opportunities for development. See how resilient your team currently is and which areas could be enhanced. Leaders can have a huge impact on the resilience and wellbeing of their teams. Gain insights into how a leader is currently perceived to support resilience and wellbeing by those they line manage and how this can be improved. Learn how a group of leaders in your organisation are perceived to support resilience and wellbeing both collectively and individually. Understand what could be improved. The Wraw Organisation report provides you with rich insights into how resilient your employees are currently feeling, how your leaders are perceived to support wellbeing and where specific pressure points are in your organisation. With this information you can confidently target investments in wellbeing initiatives to gain maximum return. A measure of current resilience levels. The extent to which the effects of pressures, challenges and adversities are being felt. Combined sum of responses to questions about the 5 Pillars of Resilience. How these results compare to the global working population. How much individuals feel their resilience and wellbeing are being supported by their line manager. Also includes responses to specific statements about line manager actions and support. Strategies to enhance each pillar. Workplace pressures that are having a negative impact on resilience and wellbeing. Open-ended responses to questions about how resilience and wellbeing could be better supported. Breakdown of data by organisational segment. Next steps, development plan and personal actions.